J. Gormly Miller received a Bachelor of Arts degree from University of Rochester in 1936 and a bachelor’s degree in Library Service from Columbia University in 1938. He worked at the Rochester Public Library from 1938 to 1942, and served in the United States Army during World War II. 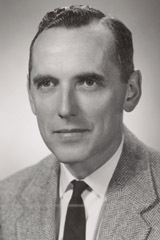 In 1946 Miller came to Cornell University as the first Director of the library for the newly established School of Industrial and Labor Relations. From 1949 until his retirement in 1977, he served on the faculty of the ILR School as an associate professor and then a full professor, teaching courses in research methods. He held numerous consulting and special assignments, including advising the Department of Labor Relations at the University of Chile in Santiago on library development plans in 1961, and advising the U.S. Department of Labor on expanding library resources. From 1962 to 1970, he served as Assistant Director of personnel and budget for libraries. In 1970, he left for Geneva, Switzerland to become deputy chief of the Central Library and Documentation Branch of the United Nations’ International Labor Agency. Miller returned to Cornell in 1973 and again served as the head of the ILR library before assuming the position of Director of the Cornell University Libraries in 1975. Under his administration, the library’s total collection grew to more than four million volumes. Miller strengthened library rules and regulations to fight theft and vandalism. Space continued to be a problem, and the first off-site storage facility was built in 1979. During Miller’s stay at Cornell University, he actively participated in local government. He was an Ithaca alderman from 1959 to 1963 and again in 1968, when he was chairman of the Ithaca City Charter Revision Commission and co-chairman of the Common Council’s Finance Committee. He retired from his post as University Librarian in 1979, but returned to serve as Acting Librarian in 1985. © 2018 Cornell University Library, Cornell University, Ithaca, NY 14853.